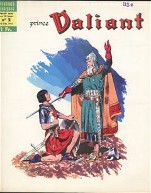 Aventures Heroiques (Opera Mundi publications; edition Rempart) printed at least 12 Prince Valiant books around 1960-1970. I call this serie 1. This material was also sold to the "Nooit gedacht" and "Vivo" magazine publishers from Holland and the L'avventuroso companie in Italy Compare their books nr 1 with the nr 1 below!! All the same covers! In advertisements inside the books they tell you that you can buy these books per 12 issues. Till this far I didn't see more then the 12 numbers below. Out of these magazine like books they did print at least 2 summary books. I call this serie 2. Value for serie 1 is around Euro 4. For serie 2 it's around Euro 6.